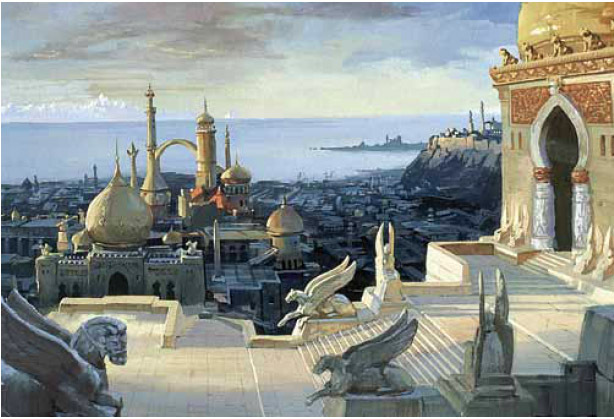 You can probably see foreshadowing of Dinotopia in some of the backgrounds I did for Fire and Ice. I enjoyed the camaraderie of the movie studio, and I have missed that feeling since. Every couple weeks Tom and I brought in a three-foot high stack of art books from the library and spread them out on the counters in the background room. One by one all the animators and layout people would come by during the breaks and we’d fire up about art and look through each other’s sketchbooks. Once in a while we would cram paint lids into the regulators of the oxygen airbrush tanks and shoot the lids across the room like a cannon, right through a foam-core target of Mickey Mouse. At the end of the production, the animators packed up their things and moved on like gypsies to other projects at other studios. Bakshi Productions shrunk down to just a small crew. The effort shifted to editing, sound, and and marketing. But there were still just a few background paintings to finish. At Bakshi’s request, I brought them home to finish in my own apartment in Highland Park. It was lonely working on those backgrounds at home instead of in the studio. One thing I loved about the film work was the feeling of living inside my paintings. It was always a charge to assemble in the editing room and watch the dailies. When I saw my pictures projected on the screen with action and music, it really felt like I was inside the world I was painting, not just looking at flat compositions. Howard Pyle always talked about jumping through the picture frame and breathing the air you just painted, and that was the first time I completely experienced that feeling. I never saw the movie during its theatrical release because I was traveling at the time, and it came and went quickly. Maybe it will get a boost from the live action reboot. Blog reader Kurt asked what ever happened to all those original backgrounds. A few of them were sold in galleries, I understand that a few survive in private collections, but most are lost. Ralph Bakshi told me last year that they were all destroyed at some point when they were being transferred from one indifferent holding corporation to another. That’s the story of filmmaking. It’s a hard-won battle to assemble people and materials for a moment in time, in order to cast a few shadows on a wall. When it’s all over, there’s nothing left but the shadows. All backgrounds copyright Ralph Bakshi Productions. Thanks, Ralph and the rest of the crew! And best wishes to Robert Rodriguez and the Reboot Gang. Living inside your paintings? I love it! Given your comment about how much you enjoyed seeing your work come alive on the screen. Did you pursue more movie jobs after that or did you decide you would rather be an illustrator? Armand, after Fire and Ice, Disney studios called me up and offered me a job in their background department. But by then Jeanette and I had committed to moving to New York and freelancing, so we made the same kind of move you did. I'm really liking this series of posts. I watched Fire & Ice online last winter. I like the movie because it marks an intersection in several artist's careers. While Frazetta's career was winding down, James' was just taking off. I got a documentary called Painting with Fire last Christmas. It covers a lot about Frazetta's life, but never really touches on his techniques. I found that the only way to discover how he painted is by staring at his work for hours on end. "When it’s all over, there’s nothing left but the shadows." Well James the actual art may be gone, but that's a small price isn't it, for all the artist who were inspired by it. I was only 1 when Fire and Ice came out (wow where do the years go), so I was to young to remember it. 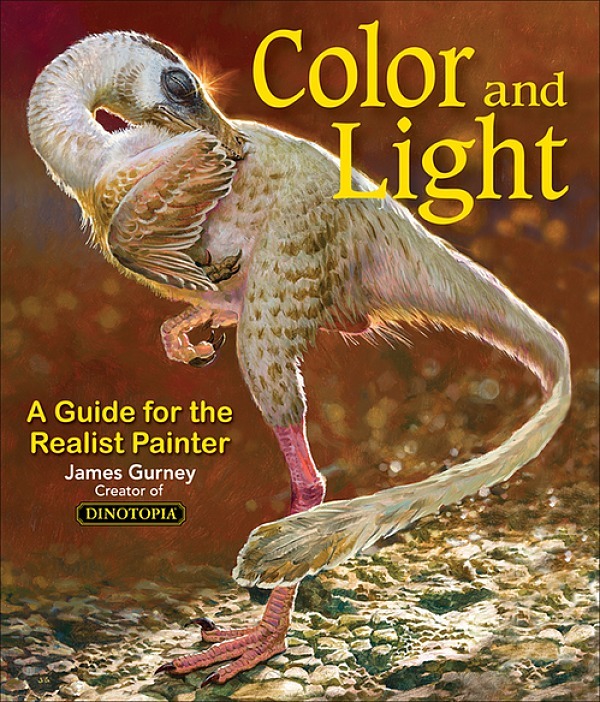 I was old enough though at 10 to remember when Dinotopia came out, and I still consider it one of the biggest influences in my pursuing a career in art, and I'm sure I'm just one of thousands of similar stories. As always, thank you for your work. Great series -- and very poetic entry. I'm going to have to re watch Fire and Ice and give the BGs a closer look. With all the live action reference he shot for this, I'm surprised he didn't include any model work a la the old Fleischer method of painted backdrops and models on a big lazy susan. My understanding was that he was a big Fleischer fan. Did you guys use any other maquettes as reference besides your awesome but temperature challenged throne? I wish Bakshi had gotten to make more films. Animated action films might be a bigger, more successful genre. I've really enjoyed these posts, and wondered about the paint you used for the backgrounds. I have just heard about cel-vinyl acrylics, and I wonder if you used them and how they compare to regular liquid acrylics. I know you mostly work in oils, now, but I've been looking for some really opaque liquid acrylics and wondered if these might be good. Can they be used to render images, like the backgrounds you did, or are they really only good for flat colors like on traditional animation cels? 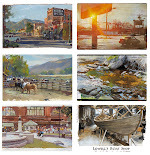 PT Waugh: You're right--Frank didn't talk much about technique, and I think he mostly figured out how to paint the same way--just looking at paintings you like and figuring how to replicate it. Daroo, yes, I wish Bakshi had made more high fantasy and action animated films. It was always a challenge in the days when animation equaled kiddie films in most peoples' minds. I liked your perceptive comments yesterday about the annoying look that rotoscoping sometimes gets when it's not done well. The same thing happens with photo reference for illustrators (I've been guilty of it), and with motion capture when it takes us into that uncanny-valley feeling that we're looking at a mask of something, not a real thing. Artistry wins out with any technique. And no, we didn't do any other maquettes that I can think of--the time was just too tight. Diane, Yes, cel vinyl is very opaque and kind of creamy. It comes in bottles with spout tops. It comes in many colors that you choose from a color chart, rather than by pigment name as I recall. It works great either for painting with flat colors or for gradated passages, which is what we were doing. These are some fantastic stories! Thanks for sharing them. Dan, thanks for sharing these. My brother was one of the animators on the film and I've shared these posts with him. Looking at some of the work he shared with us inspired me to try rotoscoping with a super 8 camera when I was a freshman in college. It didn't take long to realize it was a ton of work for one person and the project got put on the back burner to go chase girls! This has been really interesting! Can't help but think Disney would have earned a great artist, but that some of the great things you've created independently might not have turned out the way they did! Things happen for a reason, they say. So here's to you having the chance of participating in movies again! I guess we would enjoy that final outcome too. such a wonderful series of posts on this film. i'm really happy you took the time to do this posting right! so much wonderful infomation and stories. insight into working with frazetta, hilarious fake thumb story with photo, and a to top it off a photo of thomas kinkade when he was in middle school, haha! Thank you for taking the time to remember this experience. I have always loved behind-the-scenes stories and the insights they bring about the creative process. I always underestimate the role that simply having fun plays. James, not Dan! Sorry...had just seen the name Dan Gurney a few minutes before. My apologies! Want to add my thanks for this series, too! Now I need to get out my Frazetta books, which I haven't looked at for too long. Great series. I saw this in the theatre as a kid. At the time I didn't know who did it or what was really going on but I was mesmerized by the look and the main character with his cool mask. When the DVD came out I bought it right away and really enjoyed the included dvd on frazetta. This movie along with Bakshi's LOTR really left an impression on me and surely contributed to me becoming a professional artist. I have an original Bakshi LOTR poster hanging in my house :) Thanks for sharing, James. Really great reading. I really love "Fire and Ice" and have watched it for several times. What I especially like is the atmosphere of the movie, which is really special. There are only very few movies at all which deals with this kind of "Low Fantasy", and "Fire and Ice" is probably unique in managing to create a real feeling for the world. The wonderful background paintings are one of the main reasons for this special atmosphere. All those vast jungles and swamps full of dangers and wonders, prehistoric beasts and arcane denizens. Even despite the fact that the story or characters of the movie are not directly based on any story or characters of Robert E. Howard, you can still feel its influence, not only because Frank Frazetta painted many famous covers for his stories (for example for many "Conan" stories), but because it was mainly Howard who imagined this fantastic world of the Hypborean Age. I have to admit that I have still not read that much of his work, but he had an incredible talent to write in a very powerful and epic style, and there is wonderful onomatopoeia in his writings. There are a lot of really trashy illustrations of his stories, but Frazetta was perhaps the first one who really managed to visualize Howard´s visions. To see a whole movie which is made in this way, is just great. Had you also any involvment at the designs for the monsters and critters? Thanks for the behind the scenes look... I live for that kind of stuff. Really entertaining and informative post, Sir! This has been fantastic, this movie was our first introduction to you and Kinkade and a lot of us in the animation industry have been curious about your experiences on it. Thanks. It is a real shame that the making of film is lost in the faults or salt mines (like they discovered for Elvis films). But hopefully they will find the making of in all it completeness. It's a time capsule.